Hi guys! I’ve been busy, so I haven’t updated for a few days, but I’ve been dying to show you these new shoes from Compulsion! Compulsion is a new brand, by Compulsion Overdrive. I’m familiar with Compulsion’s work cos I love the guns from BREACH! I’m pleasantly surprised by this move from creating weapons to fashion, and look forward to more goodies to come. 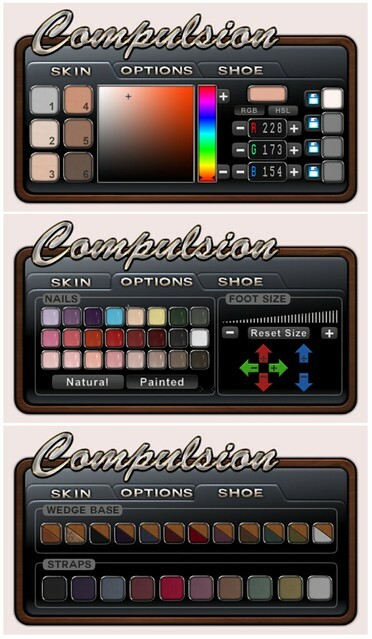 These shoes look amazing, and each style includes a HUD to customize skin tone, select nail colors, and change shoe color. I found the HUD super easy to use, and was able to get a great skin match within minutes. I could be wrong, but these did not seem like they were rigged mesh. I was able to select them, and also, I noticed some movement/shifting near joint when I changed poses. More info about the HUD can be seen on the Fashion Compulsion HUD Reference page. Visit Compulsion to get yours! The three styles are just beautiful, and the feet looks amazing. I didn’t knew this brand. Thank you for share. Great post! Both a Color Picker and a RGB Entry? BUYING ALL THE SHOES. uh oh! I’m going to have to get these! Who can resist a color change hud??? WOW! I can see my Linden Account diminishing by the second. Thanks for the post! I Love that third pair. Must have NOW! Just wanted to comment on this in case people were wondering why or what difference it makes. I made the decision to not do rigged feet because of resizing, with rigged feet you have to use a specific leg shape for them to work perfectly, I felt the ability to re-size was more important to people although it takes take a little more fiddling to get the shoes to fit in the first place. I have quite a few of Breach’s guns and the attention to detail is amazing so I fully expect these shoes to be the same. On their newer Mesh guns, you can completely resize (scale) them, which is a boon for a petite girl like me as their older prim-based MP7 looks like an Assault Rifle on me. On the subject of Mesh on these shoes, and you thinking they may not be rigged, that would be consistent with the way the Breach guns are as I’ve described. I would be willing to bet these shoes are resizable in some way? I had the same problem. But these shoes have been very easy for me in terms of matching my skin color. But I have a light skin. Very nice! I’ll try demos for sure. I am in the store now trying the demos and I can’t believe how easily the color is matched with my skin. I love these shoes. The Envy style looks amazing! I think I’ll have to head to their shop and check some things out! I’m really impressed with how easily you match the skin color. i have such a hard time. And there’s always a seam if the shoes don’t have an ankle strap. I got the Envy fatpack. One thing I’ve noticed, is that for the shoes to blend in the best, you should have Atmospheric Shaders on. You have to do the same for the SLink barefeet as well. It’s an SL glitch.